A complete unit with direct instruction to the student, ample practice problems and word problems. Common Core aligned. Great for independent practice/homework. 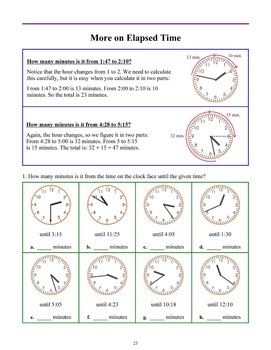 This unit covers reading the clock to the minute, finding time intervals (elapsed time), using the calendar, and making simple conversions between units of time. such as in 20 till 6 or 10 past 11. 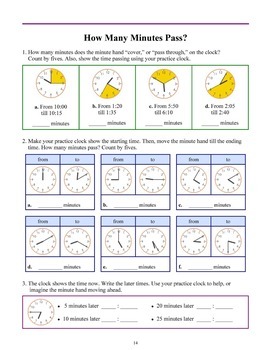 Next, we study elapsed time in more detail in the lesson "How Many Minutes Pass." 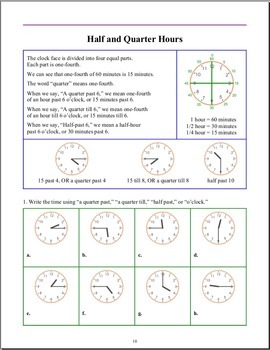 The lesson "Reading the Clock to the Minute" completes the topic of reading the clock, because the student will now be able to tell the complete time. From that point on, the focus switches to finding time intervals and other time-related calculations. The next two lessons about calculating elapsed time emphasize dividing the time interval into easily-calculated parts: For example, to find the time elapsed from 10:30 AM to 7:00 PM, the student learns to find the elapsed time from 10:30 AM to 12:00 noon and then from 12:00 noon to 7 PM. The same principle is followed when the time-interval looks more complex. 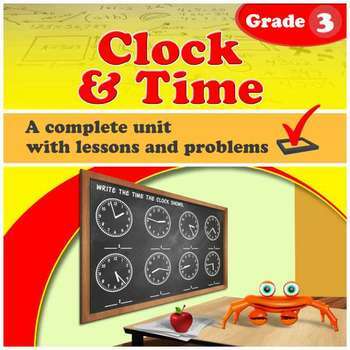 This unit does not yet introduce the idea of adding or subtracting hours and minutes vertically in columns. We also study using the calendar, and converting between time units, such as changing 2 hours to 120 minutes or changing 340 minutes to 5 hours 40 minutes.